Former President Obama made political hay out of denigrating the rich during his time as POTUS and his support base swallowed the hypocritical, leftist hate speech hook, line, and sinker, to steal a fishing analogy. The problem is, Barack Obama may have a “degree” in community organizing, but he knows how wealth is created and where the big bucks come from. And it isn’t from a government owned money farm. Now that Obama is out of office, the big ‘O’ needs to find a source of income to pay for all that luxury he’s become accustomed to, and what better way than to follow Bill and Hillary Clinton’s example by making a speech for a Wall Street investment firm to the tune of about $400,000 dollars an event! Since his days as a community organizer, Barack Obama has bashed the evil rich guys at Wall Street, but what a difference a few months makes. Now, we learn just how much money he will make at his new Wall Street job. Apparently, Obama plans to laugh all the way to the bank. The messianic orator of leftist drivel knows where the big bucks come from! Today, we learn that Barack Obama is following in the footsteps of his Clintonite predecessors. 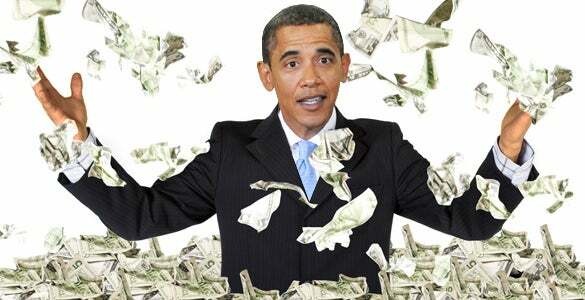 Like Hillary Clinton before him, Obama is to be paid $400,000 for a one-time speech by a Wall Street firm. Fox Business said it confirmed Obama’s appearance with senior people at Cantor, a financial services firm. Obama will serve as the keynote speaker for one day at the company’s event, sources there told Fox Business. The network’s sources said Obama has signed a contract for the speech with the mid-size investment bank in New York. Cantor is waiting to coordinate with Obama before making a formal announcement, it continued. Obama can reportedly back out of the arrangement if scheduling conflicts or other concerns arise, it added. That hefty payout, [$400,000] which is roughly seven times the median household income in the U.S., puts Obama in the same league as Bill Clinton on the lucrative presidential speaking circuit. But unlike Clinton, Obama was a vocal critic of Wall Street as president. As Fox Business notes, Obama derided “fat cat bankers on Wall Street” during a 2009 TV interview and regularly blamed big banks for the 2008 recession. The fact that Barack Obama would accept money from the same Wall Street “fat cats” he took so much pleasure in bashing sheds a whole new light on the political chicanery and dishonesty career politicians are capable of. Barack Obama, not surprisingly, is simply incapable of feeling shame! Look Who Was Just INDICTED By Feds — The HEINOUS Drug-Trafficking Charges! A Year Later, Retail Giant Makes Stunning Confession About Shocking Bathroom Scandal…KARMA!